Valdani Pearl Cotton is used for the border in this piece. Valdani is a Romanian company that makes a broad range of threads in silk, cotton, and other fibers for hand and machine embroidery. All of their threads, even the solid colors, are hand-dyed. The cotton threads are made from long-staple Egyptian cotton, which makes then quite durable. 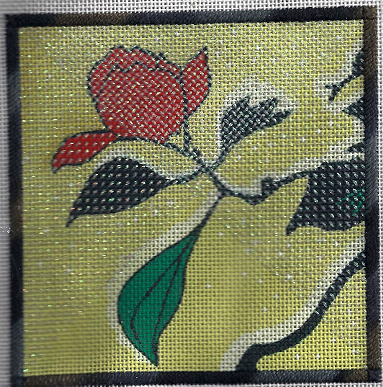 This dark multi-color, called Ebony, made a perfect outline for my glass stitching. According to the company all their shades are colorfast, but I haven’t tested that yet. I have tried their three-strand floss, their crewel wool, silk floss, and both their #5 and #8 pearl cotton. I love them. Their pearls ere slightly thicker than the same size in DMC. This made #5 a bit hard to thread in a 22 needle, but the coverage was lovely, completely covering white canvas. This can sometimes be a problem with DMC and Anchor. This additional width also makes it a great choice on 13 and 14 mesh, places where I wish there was a #4 pearl. I liked it better than Finca pearl from Presencia. While that thread often has uneven thickness, this thread was perfectly even throughout. There are over 2000 variegated colors and the range is amazing. It includes many multi-color shades that are unique as well as lots and lots of dark and muted shades that are often missing in other lines of overdyes. This makes Valdani an excellent choice in threads. Also unique to them are their collections of threads. These are collections of 12 balls of pearl in a themed group. They can be solids, variegateds or a mix of the two. Some, such as Beige & Browns, give you a lovely set of neutral variegateds (great for many backgrounds). Others, such as Garden Gatherings, have been picked by a designer to coordinate. Currently there are over 125 different collections like this. I could easily see buying several to have on hand for projects. A nice touch is that color numbers are coordinated across all their lines, making it easy to convert from pearl to floss or from silk to rayon. Valdani Pearls are available in sizes 5 (used here), 8, and 12. They are packaged in 10g balls. #5 has 42m per ball. #8 has 67m per ball. #12 has 100m per ball. A few colors are also available in skeins. If you have used pearl in balls from other companies, you’ll be surprised because these balls are smaller and softer. That’s because they are not wound on a tube, but are wound like knitting yarns. Valdani’s North American distributor is in Canada. Because their selection of colors is large, you probably want to check out their site, https://www.valdani.com/home, and possibly order some threads for yourself. Did I mention that I love these threads? Who carries it in individual quantities? You would need to look on their website for retailers.